Have you stood at the ocean’s shore gazing into an endless blue-green vista? How about the mountains on a cold, clear night? Have you stared into the blackness littered with bright points of light? Can you imagine how high the heavens are above the earth? The love of God is higher than that. He is not measured or calculating in his love for you. It will blow your mind and wrap you up. To think that you could even be known by this huge Creator is astounding. But you are known AND loved. 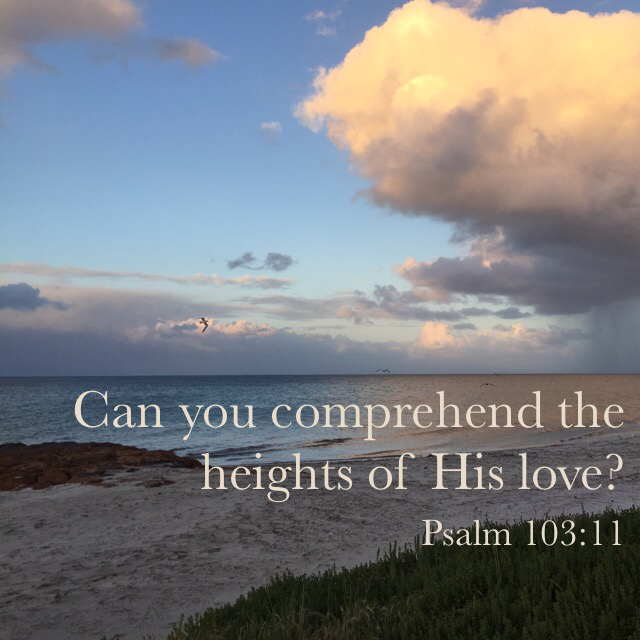 His desire is that you would know the height, depth, breadth and width of his love… and to know this love that surpasses mere head knowledge that you would be filled to overflowing (Ephesians 3:18-19). God’s promise is that if you fear him, you will be drawn into this unending love. This is something you can do! To fear God means to hate sin (Proverbs 8:13). Sin will always stifle the love of God in your life. That is not God’s fault. It is your responsibility to turn away from sin and turn to your Father. As you turn from sin, God will not hold it over your head. He removes it as far as the east is from the west. Then he envelopes you with his love. He wants you to experience this. The pathway to this overwhelming experience of the love of God is to fear him… to choose intimacy with him by hating any love-killer… that is, sin. Choose his love today!